As a young girl, Maggie Rowe took the idea of salvation very seriously. Growing up in a moderately religious household, her fear of eternal damnation turned into a childhood terror that drove her to become an outrageously dedicated born-again Christian — regularly slinging Bible verses in cutthroat scripture memorization competitions and assaulting strangers at shopping malls with the “good news” that they were going to hell. "Former Arrested Development writer Maggie Rowe spent her Christian childhood agonizing over whether she was devout enough to to heaven. Brimming with characters wacky and sincere, this memoir centers on her time in an Evangelical psychiatric facility." "A highly intriguing, personal and bravely written memoir about the author confronting her childhood terrors of eternal damnation and faith." "Everything about Sin Bravely is unexpected. It's a deeply personal examination of what can happen when you take religion to the extreme, but it's also hilarious. Maggie Rowe tells her own story of checking into an evangelical psychiatric facility after years of worrying she isn't devout enough. Her fear of eternal damnation is real and at times uncomfortable to read about. But what I found so refreshing about this book was the way Rowe balanced serious religious reflection and humor without an ounce of snark or cynicism." — Eric Kaplan, author of Does Santa Exist? "The writing is absolutely brilliant, and I found myself hanging on every sentence – no, every word, eager to consume the wit and creativity that flows through Rowe seemingly effortlessly"
Sin Bravely is "an unflinching examination of the dangers of literalism in the religion department. And while you might be distracted by the sound of your own laughter, it's a dead-serious message that won't soon be shaken off." "You will laugh, nod, and marvel at Rowe's story-telling ability." "Readers of Rowe's account can reexperience their own spiritual crises and reappreciate the good news of divine grace when they hear it pronounced." "Rowe is a winning narrator, and you can’t help but root for her. 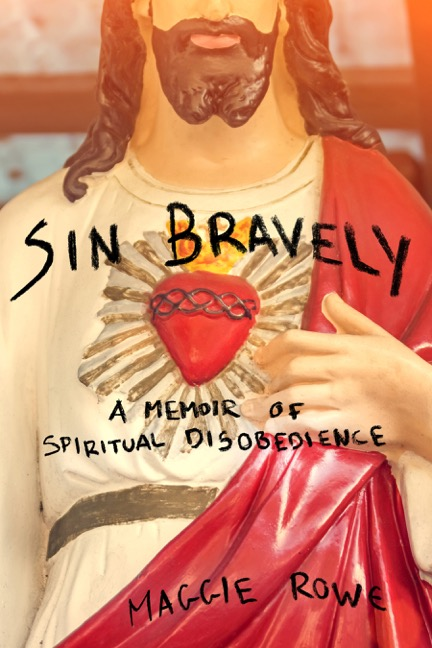 ... 'Sin Bravely' inadvertently shows the value of a good spiritual director"
Sin Bravely is "a fascinating book that explores the trouble that people who are naturally anxious can get into when they subscribe to a literalistic view of religion." "Devotees of Rowe’s comedy and those with a strong interest in born-again Christianity will enjoy learning about her strife and road to redemption. ... An enthusiastic chronicle of how one woman’s religious passion almost swallowed her whole." Starred as a Weekly Pick - "Rowe puts readers in the front car on her spiritual roller-coaster. ... Rowe’s fantastic book is a born-again version of One Flew Over the Cuckoo’s Nest complete with a Nurse Ratched analogue (the demanding, no-nonsense Bethanie). Not for the faint of heart, this is a cutting examination of Rowe’s spiritual evolution that plunges into the big questions with the fearlessness found in the most brilliant of comics." Readers who have wrestled with self-doubt over the strength of their convictions will find a funny, frank companion in this frantically compelling memoir. The author grows up Christian, but instead of feeling secure in her eternal salvation is besieged by the anxiety of never knowing if she is really sincere enough. Readers will cringe in recognition of their own awkwardly sincere teenage selves as she tries to secure her eternal destiny by proving her commitment to God. The anxiety reaches a crescendo in college, and she heads to a Christian mental-health facility to figure things out. Once there, she meets a cast of characters, some of whom are helpful (an honest doctor, a woman struggling with her own past) and some not so much (an inept therapist, an overly optimistic man prone to quoting Bible verses). Rowe’s book does not provide easy answers, but her capacity to eventually sin bravely signals a new beginning. This engaging and adventurous book is an excellent companion for fellow seekers. Anxiety, guilt, and a debilitating fear of going to hell don’t feel like they’d make for a great vacation read, but Sin Bravely, Maggie Rowe’s hilarious—and ultimately heartwarming—story of her time spent in an Evangelical Christian rehab, is. The former Arrested Development writer entered said rehab to try and work through her unrelenting fear of the fiery pits of Hades. Rowe’s anxiety is mostly stoked (ha!) by her intelligence, and the existential questions are relatable to anyone whose logic has thrown a wrench into blind faith. The scene where Rowe enters an amateur stripping contest in order to sin bravely (a particularly funny version of exposure therapy) is laugh-out-loud funny.